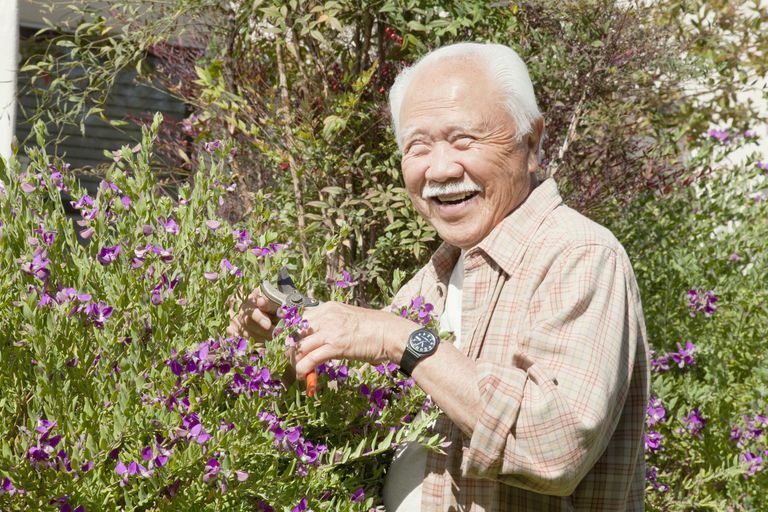 Having access to a nice garden can meet several needs for people with dementia and their caregivers. Good garden design can allow persons with the hobby of gardening to continue to participate in this meaningful hobby. It can also be part of a treatment plan for people with Alzheimer's who are very restless or agitated and who like, or need, to walk a lot. Provides physical exercise, opportunities to relieve tension, frustration and aggression. Allows the person with dementia to take care of flowers and other plants. Provides personal space for reflection and privacy. Provides time outdoors in a safe place. Provides stimulation with color, smells and sounds of wildlife. One of the best designs for a garden designed for people with dementia is a figure-of-eight looped path, or similar, simple returning-path system. You can plan a garden that allows access outside but always leads the wandering person back to their house or building. Think about visibility and observation so caregivers can relax if they use the time for separate pursuits. Good dementia garden design should cater for the able-bodied as well as those who have problems with mobility. There should be seating such as benches along the paths to allow places for rest and enjoyment of the beauty. Adding some raised planter areas can allow easy access to planting and tending to the garden. These planters can be placed about the height of a wheelchair so that the person can simply reach over to the plants. The garden design should also include some shelter from the sun and the wind, such as a gazebo. Bushes and trees provide structure and direct movement. If possible, choose many perennials (plants that grow back each year) so that you don't have to replant each year . Fill the garden with bright flowers. Place herbs, lavender and other plants so that when brushed they will release their fragrance. Pathways that are smooth, and low in glare. Even walkways without steep gradients or steps. Wide enough walkways so that as dementia progresses, wheelchairs can easily fit on the paths. As dementia moves to its later stages, people eventually lose physical skills and ability over time. Use upward bevel edges on concrete walkways. This can keep wheelchairs from rolling into lawns or landscape beds. Consider placing an attractive fence around the garden so that the person with dementia can't accidentally wander outside of the garden. Handrails can be used along the pathways to help those who have difficulty in walking. In gardens you need protection from the sun and the wind throughout the four seasons of the year. Use of nonpoisonous and nontoxic plants. Plants can harm people if they eat parts of the plant. Others can cause skin rashes and irritation. Too much light reflection or dark areas are not helpful to older people who can have problems with their sight. A number of degenerative eye conditions are common in old age. Include people with dementia in planning and designing the garden. Many people with dementia will have built up a lot of knowledge and experience about gardening. They can contribute in varying ways, from active involvement to picking their favorite flowers.